Pep Guardiola has agreed to host a group of French coaches, including Real Madrid Castilla Zinedine Zidane, at Bayern Munich’s training complex this week. According to ESPN FC and AS, the French delegation (which also includes Claude Makelele and Willy Sagnol) are observing Guardoila’s training sessions this week in an effort to soak up the expert knowledge on offer as they work towards their UEFA Pro Level Three Licenses. 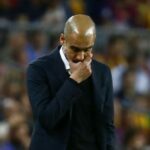 Given Guardiola’s lasting allegiance to Barcelona, it seems highly unlikely that he would actively try and help the man tipped to be Real Madrid’s next manager. So it stands to reason that this is all an elaborate ruse to feed Zidane (and fellow ex-Real Madrid player Makelele?) false information. Midfielders are overrated — The formation of the future will be 5–0–5 with a big, gaping hole in midfield so you can surround the opposing team and make them feel trapped in the middle of the pitch, prompting them to immediately surrender. No less than 80 hours of training per week — Practice makes perfect, so 16-hour days of hard, unrelentingly grueling training sessions is the only way to ensure that your players will be prepared for their match at the weekend. A good training session doesn’t end until every last one of the players loses consciousness during a passing drill. Avoid passes at all costs — Speaking of passes, don’t let your players do them. The chances of scoring on a pass within your own half is 0%, but your chances of scoring with a shot from your own half is probably something like a solid 3%. So every pass eliminates a chance at a goal. That’s just mathematics. Give Cristiano Ronaldo away for free — As a general rule, if Cristiano Ronaldo is in your team, you should definitely get rid of him as quickly as possible for nothing in return. I, Pep Guardiola, have won 19 trophies without Ronaldo in my team. And I have won exactly zero trophies with Ronaldo. Clearly that proves he is an albatross with a six-pack. Never doubt The Word of Pep — Many people will try to tell you that this advice is “insanely wrong” and “so obviously asinine” but they just want you to fail. Remember. None of them invited you to Munich to learn their super top secret coaching secrets. They don’t love you. I don’t either, but maybe, if you do everything I say, I will someday. Never forget that.